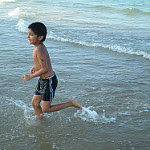 Yesterday, my family and I went out to South Padre Island to cool off. The Rio Grande Valley has had weather in the 90s until these past couple weeks, which are the dog days of summer, or as you will hear called around here, "la canicula". If there ever was a time to go spend some time at the beach, it is now. You have probably heard of people in New York City who have lived there all their lives and never visited the Statue of Liberty, or any of the famous attractions. Living there, they can go any time they choose, so they don't go. I think it's the same here in South Texas with South Padre Island. Our family does not go and take advantage of this great attraction very often. It's there. We could go any time. In fact, we have typically gone to the beach at South Padre Island during the off season, closer to November. The weather is still warm and the water is still warm. More importantly, we do not have to deal with the traffic. On the way to the beach during the summer, traffic slows down in Laguna Vista. Then, you are creeping along through Port Isabel, the Queen Isabela causeway, and then the City of South Padre Island to find your favorite beach access. The excitement of getting on the beach makes the trip out less daunting. After sunset, however, the reverse trip gets as congested as the trip onto the island as vacationers begin their exodus. But, if you don't mind spending a little more time on the island, you can avoid a good chunk of the return traffic by waiting it out at the bay side. The cool thing about South Padre Island is that there are two beaches. One beach faces the Gulf of Mexico. The other beach faces the Laguna Madre. So, before sunset, you can drive from the beach access to the bay access and watch the sun go down over the water. The bay side of South Padre Island is much calmer than the Gulf side. You can hang out and picnic as the sun sets and the other vacationers sit in traffic. Of course, even if you're not that into going to the beach, South Padre Island has much to offer in terms of outdoor activities. What makes the outdoors attractive at the Island is that the outdoor temperature is typically much cooler there than it is inland. So, even without splashing around in the water, you would suffer the summer less. Rob Nixon of Waiting for the Next Swell, recently wrote a post about sharks. I didn't mention sharks to my family lest they freak out. But, I figured that a little vigilance on my part would suffice. I did see the occasional bird diving into the water after fish; but not many. We weren't exactly getting slapped in the face by fish that would attract sharks. We did see minnows darting around in the water, which was surprisingly less murky than I remember. In the end, we survived a fun day at the beach. I did spend a couple hours today cleaning the sand out of the car. One thing about going to the beach is that sand gets EVERYWHERE. Despite the extra work, I figure the fun we had was worth the cleanup. Except for a film camera, I left all my electronics in the car. Sand, humidity, and salt are not kind to electronics. Furthermore, nothing posted online could be as interesting as our little escape. I'll take the film in for developing some time this week. I am not anxious to plaster the interwebs with photos of our weekend getaway, like I would have done a few years back. The only reason I'm writing about this today is to suggest that you take your family to the beach. It is only a short while longer before school starts up again. It is going to be really hot between now and then, and probably after. But, once school starts, things get complicated. You are less likely to go. Now is a good time to hit up South Padre Island for all the good times it has to offer. They have shopping, restaurants, bungee rides, the beach, a movie theater, boat rides, rental bikes and carts, and, most importantly, stories your family can tell about the good times they had. I was shocked to see the temperature reach 100 degrees the other day. Shocked I say! The run of 90 degree weather we have enjoyed up to now has run out. Back are the days of 100 degrees. I had hoped we would make it through the full summer in the 90s. That would be so nice. Visit your library during the hot hours. Have some quiet "me time". The movies have always been a good way to escape the heat. Hit the matinees. Go outdoors. Since you're going to be hot and sweaty anyway, go do some outdoor stuff. At least you'll have something to show for your perspiration. Go to South Padre Island. Sharks be damned. They can't bite everybody. You have good odds of keeping even numbers of limbs. That's all I can think of off the top of my head. Do you have any ideas?